The curlew is the largest wader that occurs on The Wash, and is easily identified by its distinctive down-curved bill and cur-lee call. The sexes look alike, but males are up to 25% smaller than the females with noticeably shorter bills. Confusion species: Whimbrel (left) has a distinctive pale supercilium, a dark eye and crown stripe and a shorter, more down-turned bill than the Curlew (right), which has a uniformly-patterned head. Photos by Sam Franks. 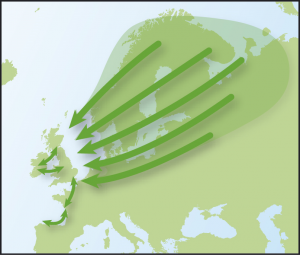 Curlews breed throughout Europe and birds arrive on The Wash from northern Britain and Scandinavia. Curlew are commonest in the winter months, but are present on The Wash throughout much of the year. 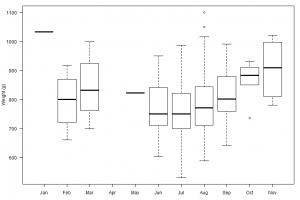 As the graph below shows, most are caught during the autumn passage period of August and September. The number of Curlew caught on The Wash, by month, between 1985 and 2016. Curlew feed both on muddy shores and grass fields all around The Wash. They are best seen at roosts over tide high tide, such as that at Snettisham RSPB Reserve. Curlew use their long bill to probe deep into the mud for worms, clams, shrimps and small crabs. They also feed extensively on grass fields on a wide range of worms and invertebrates. 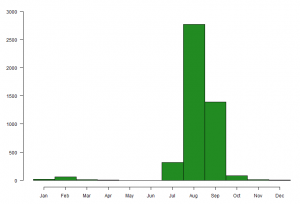 As the graph below shows, the number of Curlew caught each year varies. Some annual fluctuations are related to the success of catching attempts rather than being representative of the number of birds present. 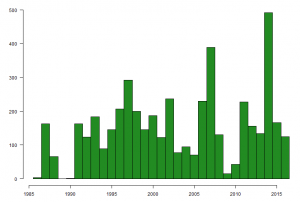 The number of Curlew caught on The Wash, by year, between 1985 and 2016. The longevity record for the oldest Curlew to be ringed in Britain & Ireland stands at 32 years and 7 months. The following map shows where Wash-ringed Curlew have been found abroad (blue dots) and where foreign-ringed birds that have been encountered on The Wash were ringed (maroon dots). The graph below shows the average weights, by month, of Curlew caught on The Wash between 1985 and 2016. The thick horizontal line gives the average weight and the box indicates the middle 50% of weights. The thin vertical lines indicate the range of observations, with the circles identifying the most extreme values. The group marks Curlew with white flags bearing two alphanumeric characters on the left tibia and a plain scheme marker on the right tibia. Birds caught prior to 2016 have a white scheme marker, birds marked 2016 and onwards have an orange scheme marker. This project started in 2012 and the group has recorded over 600 sightings providing information on survival rates, which is a key data resource for ongoing work by the RSPB and BTO in diagnosing the reasons for population declines in Curlew. 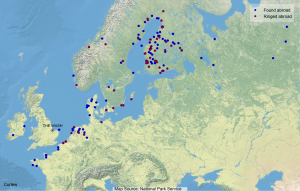 The project also provides information regarding the migratory patterns of Curlew with regular sightings from the breeding grounds in Finland and Scandinavia. Curlew also are known to roost in fields, sometimes several miles inland, and the group is especially keen to record sightings of wintering Curlew in fields to gain more information on the conservation requirements of these birds.